You run a lawn care business, or maybe are thinking about starting one. You likely got into business (or are thinking about starting your own business) because you enjoy being outside, like helping people, and like seeing the results of a hard day’s work. Trying and testing different marketing strategies probably isn’t why you got into the business. But if you’re in business you need customers, and to get customers you’ll need to dive into the world of marketing. The good news is you’ve done some marketing already. Every time you talk about your business or send a quote to a potential customer, you are marketing. But don’t stop there. If you’re looking to step up your marketing game or assess your current marketing efforts, this article is for you. We’re going to break these strategies and tactics into 4 easy-to-follow sections. These are actionable ways so that marketing can work for you. Let’s dive in! First things first. If you want customers to find you, you need to go where your customers are looking—you need to be online. Bright Local found that more than 50% of consumers search for local businesses at least once per month and only 5% of survey respondents said they never search for local businesses online. Consumers research businesses online, and researching lawn care companies is no exception. Having your business online also gives potential customers a way to contact you and it helps establish your company’s credibility. So you’re ready to get your business online, but where to begin? Get started by setting up a simple website. Your website doesn’t need to be complicated to be effective. Instead, keep your messaging simple and straightforward. Your website should communicate the services you provide and the cities/locations where you provide these services. And, of course, make sure that your website makes it easy for people to contact you. 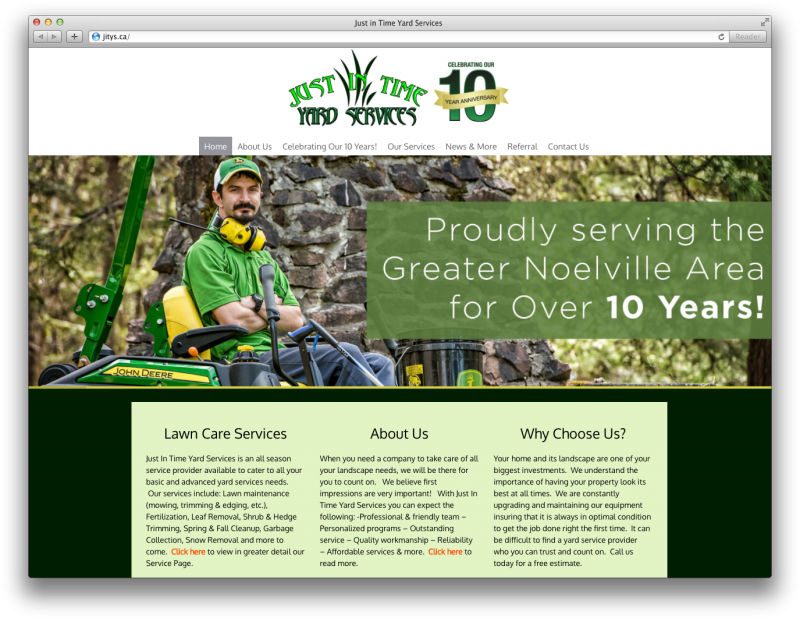 Just in Time Yard Services has done a great job with their website. As a visitor to this website, you know you are dealing with a professional company and real people. The homepage features an image of the company’s owner, Justin Pitre, and you can easily navigate the website to find service offerings and info on how to contact the team. You most likely have all the information you need to set up a website (written down, on a flyer, in your head), so put aside some time to gather that valuable content into one document and you’ll be ready to go. You can start out by building a simple website with a free platform like Wix, or you can work with a professional web developer who can assist with your online strategy and design you a custom website. If you use just one social network for your business, make it Facebook. With well over 1.5 billion users in 2016, Facebook has the most users out of all social media platforms. The demographics of people who use Facebook show that the majority of Facebook users are likely the household decision makers who would be pursuing services such as lawn care and landscaping. Facebook is free to use and easy to set up—with a bit of work and by taking or sourcing some good company photos, you can have a professional Facebook page up and running in just a few hours. Consistency is key, to create a posting schedule that you can stick to. For some companies, this may mean posting once a day, but for others, it may mean once a week. Facebook is a space you for you to be creative. Share company updates, seasonal service reminders, special offers, and before and after shots of your work. If you need some ideas on what to post on Facebook, we’ve put together a month worth of Facebook post ideas that you can check out here, complete with some tips on selecting your page’s profile and header photos. Once your website is set up, make sure you claim your Google Business listing. This is an important next step for potential customers to find your company info and website. 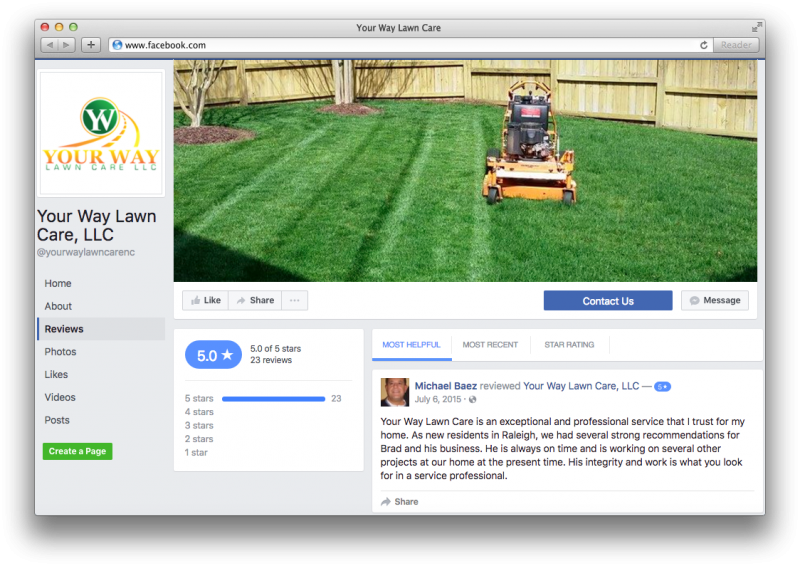 This listing can help your lawn care company (and contact info) show up on the 1st page of Google and will give you space online to manage your online reviews. Setting up your Google Business listing is easy. If you need some help getting started, check out our article on setting up your Google Business listing. 84% of local consumers trust online reviews as much as personal recommendations. This means that as soon as your business is online, you should actively be trying to get reviews. Of course, you want lots of great reviews, but nearly 70% of consumers are confident about business after reading less than 7 reviews. What does this mean for your business? Get started with even a few reviews and you’ll be ahead of the competition. 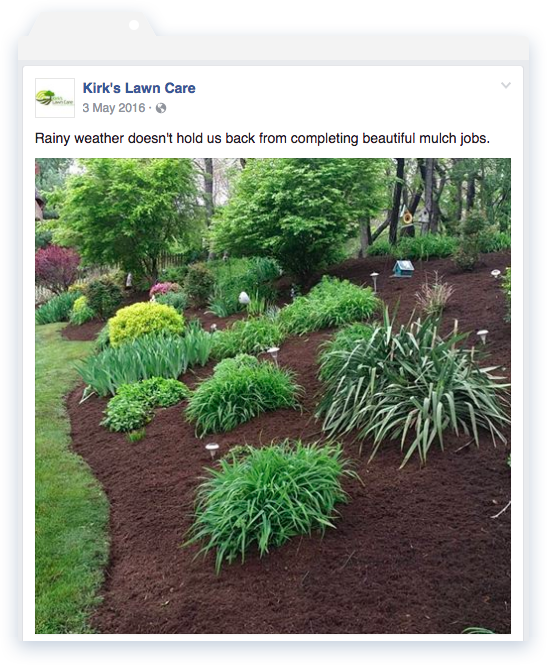 Your Way Lawn Care has done a great job getting reviews on their Facebook page. With more than 20 five-star reviews, potential customers will feel confident in the service they provide. The number of reviews: focus on developing a strategy that will help you get lots of reviews over time. Don’t try and get a bunch of reviews all at once—implement a strategy that is scalable and sustainable. The value of the review content: try to get your customers to provide examples and substance to their reviews. 5 star reviews are great, but 5-star reviews with a few sentences about your great services are way better. High ratings: of course, you should be trying to get good reviews with high ratings. So how do you start getting reviews? Send your customers a follow-up email after the job is complete. This is a great way to let your customers know the work is done and you can ask for feedback. If the feedback is positive, this is the time to ask for a review. Most people will leave a review if you just ask them to and by asking your happiest customers, you can ensure that your Facebook and Google reviews are positive. How do you deal with negative reviews? If anyone is researching your company online and finds a negative review, a good response will demonstrate your professionalism and how you deal with difficult situations. Responding to a negative review provides you with an opportunity to take a negative customer situation and potentially fix the issue. At Jobber Academy, we believe that technology can help you run a better business. This includes using technology in your marketing, which we’ve covered in the first part of this article. But this doesn’t mean you should ignore more traditional marketing strategies. As a business owner, you should always be prepared to talk about your company and the services you provide. When you have conversations with potential customers, you’ll want to make sure they remember you and your company, so make sure you always carry business cards with you. You can get professional business cards designed and printed at an affordable price. We made this business card in just a few minutes, by using a template from Vista Print. 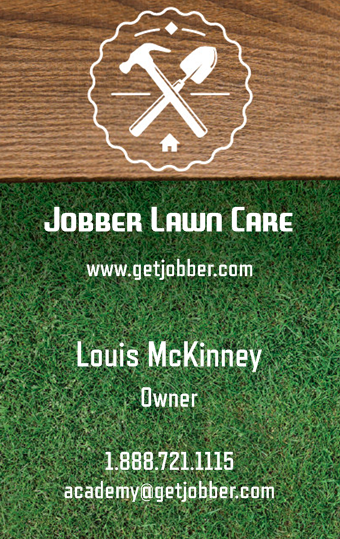 A more traditional form of marketing your lawn care business is by advertising with flyers. One of the reasons this method of advertising is popular is because you can get professional flyers designed and delivered to your home or business address at a very low cost. In terms of distributing the flyers, you can deliver the flyers yourself, which is a great free way to create awareness for your business. Before you deliver flyers, be sure to check with your local post office to see what sort of laws are in place in regards to unsolicited mail. In some areas, it is illegal to deliver unsolicited promotional materials. In terms of where to deliver your flyers, we recommend focusing on one specific area. For example, don’t get 10,000 flyers and deliver to 10,000 different homes. If you get 10,000 flyers printed, deliver to the same 1-2000 homes 5-10 times over the course of a year. This will help build brand recognition in a specific area. Another delivery tactic we recommend is leaving flyers with your client’s neighbors. You’re already in the neighborhood, so once you complete a job, it’s easy to take a few minutes to deliver flyers and promote your business. Also, having clients in the same neighborhood is a great way to add new business without adding a lot of driving time. You can make your advertising to your client’s neighbors more relevant by offering a neighbor or community discount. 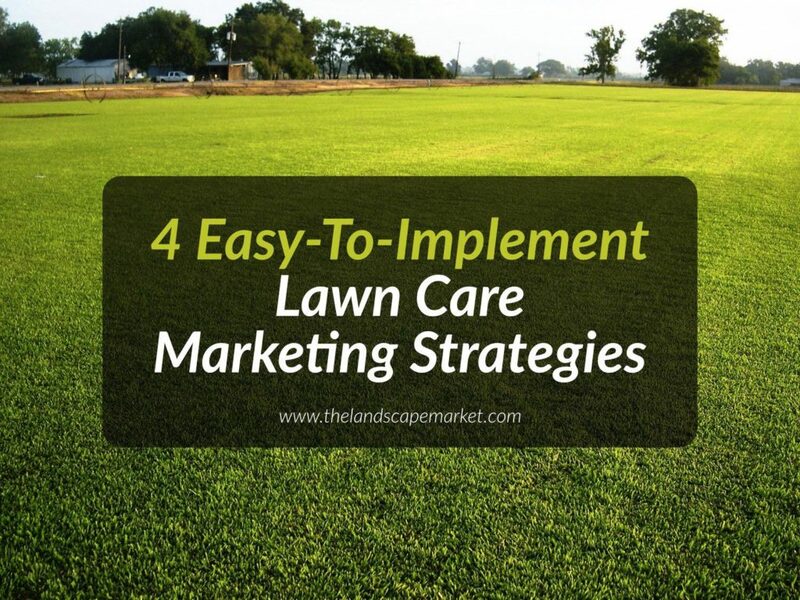 If you’re interested in some specific tactics and strategies on how to effectively advertise with lawn care flyers, we have a guide that you can check out. The first 3 marketing strategies we’ve covered dive into ways to find new customers. Of course, finding new customers will always be important for your business. But it’s important to remember that it costs 5 times more to attract a new customer than to keep an existing customer, so make sure your marketing strategy also focuses on your existing customers. There are a number of one-off services that your lawn care business might provide. Spring and Fall cleanups, mulch delivery, sod installation, and tree trimming are all examples of one-off jobs. After a job is well done, you should have a happy customer. This is a marketing opportunity! Talk to your customer about regular or maintenance work that you provide. Weekly grass cuttings, regular fertilization treatments, are all examples of ways you can turn a one-off job into a maintenance job. You might not always be able to talk to your customer in person after a job is complete, so be sure to advertise your maintenance work on any invoices you send a customer or any form of customer communication you send. When a customer is requesting one service, ask yourself if there is an opportunity to offer an additional service that your customer would value. A great way to do this is to offer multiple services as packages. If a customer is looking for some weeding services at the start of the year, there is an opportunity to upsell this initial weeding into a spring cleanup. Your package can include removing old dead grass, removing leaves, trimming and spring aeration. Another upsell opportunity is when you are working out in the field. If you or an employee is working at a client site, you may notice some new job opportunities. For example, you may determine that extending a retaining wall creates a better flow through green space. You can take a photo and add notes of this opportunity in your client management system and offer this additional service at an appropriate time. Lawn care can be a seasonal business. Before new a season, you can market your services to customers from the previous season. Keep a list of customers and the services they’ve received and reach out to them with promotional offers for the new season. As an added incentive, some lawn care companies will offer discounts if customers pay for their services in advance. This is a great way to make sure that you’re filling up your schedule in advance and getting paid early can help you with your cash flow. If you’ve made it this far, we hope you feel a little bit more confident and are equipped to take your marketing to the next level! Before we conclude, we want to address one important final point: results are not guaranteed with any specific marketing idea. Because of this, you’ll want to track your marketing efforts so you can make good marketing decisions in the future. Start simple when it comes to tracking: you can always ask customers how they heard about your business when they phone you. You’ll need a place to keep track of all this information. We recommend using CRM so you can track all your client information in one place. Best of luck marketing your lawn care company. If you have any ideas or different tactics, please leave them in the comments below—we’d love to discuss them. Disclaimer: This article is originally posted on Jobber Academy. All rights belong to the owner and no copyright infringement is not intended. Contact us if you own this article and want to take this article out of our blog including the backlink on our site. Thank you very much! This entry was posted in Garden, Landscape Contractors, plants. Bookmark the permalink.